The locals refer to the "tower" structure as a barumbara pertaining to Xandru D'Amato, an important local personality who was involved in leading his country folk in uprising against the French in 1799. This vernacular building originally formed part of a larger farm house complex which covered an area of approximately 225 square metres. The dominating element of the complex was this tall three-floor corner building which contains typical features of local vernacular architecture such as the small window apertures, and two miniature half pyramidal consoles on the inner side, placed symmetrically on the sides of a doorway. The structure of this three-floor building at ground floor comprises a system of stone arches supporting the roof, while the roofs of the upper floors are supported on wooden beams. The "tower" originally included a stone coat-of-arms on its principal façade - the side overlooking Triq Alexander, bust was defaced probably during the period of the French and British occupation of Malta as a form of damnatio memorea. The date "1765" is inscribed over one of the structure's lintels. A number of 18th century ship graffiti are carved on the exterior of the structure. The graffiti depict an Order's ship attacking an Ottoman vessel. Another graffito of a ship with a crude inscription carved on a lintel was salvaged from the ruins of the adjacent farmhouse through joint cooperation between Mepa, Heritage Malta and the owner. This artefact was cleaned and conserved at Heritage Malta's Centre for Restoration and is now displayed at the National Maritime Museum. 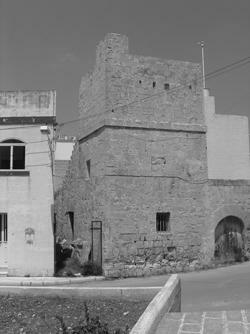 Mepa scheduled the Rural Tower-like structure as a Grade 1 national monument as per Government Notice number 492/068 in the Government Gazette dated June 6, 2006.